This portable Hand Sanitizer Station provides four dispensers on one station. 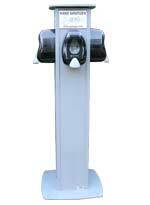 The dispensers are mounted and placed at an ADA-approved level. This hand sanitizer station will fit inside most standard portable restrooms for easy transport. You can even stake it to the ground through pre‐drilled stake‐down holes. This unit is great for all events and will accommodate up to 3,000 people at a time with over 2,000 pumps in every dispenser!